I'm spending New Year's in Hayward and staying on Big Chip. I'm hoping to leave my portable ice house at home, which means I'm interested in renting from a lodge or outfitters in the area. So far all I've been able to find are portable house rentals. Anyone know of places that rent out permanent houses? There are no permanent rentals on the flowage. It has only been legal to ice fish on it for a couple of years. Plus they draw down it's level in the winter in preparation for spring runoff. Ice fishing in Northwest WI is mainly done from portable's due to being in a snowbelt area like upper Michigan. Most lake are not even driven on. Thin ice and slush is a normal condition. I have had a Cabin north of Hayward on the Eau Claire chain since 1970. Most people use snowmobiles or foot travel. Be very careful where you go many of the lakes are flowages which means moving water others have many springs and are never driven on no matter how cold it gets. Permanent houses are rare as are wheel houses. My brother is at the cabin now and we are still at 6 inches of ice with 6 inches of watery slush with snow on top of that even with the brutal temps they have had. Big Round next to the Chip had 7 inches according to friend who went out there last weekend. Ckeck with your resort to see if there are any winter guide services for the Chip. I Know John Gillispie and Pete Mania did a show with John Detloff a local Hayward guide who mentioned the difficulties and dangerous travel of the Chip. Perhaps the Guys at Hayward Bait and Tackle could help. I'm glad this topic came up. I was wondering about ice fishing the flowage earlier today. This thread already answered a lot of my questions. Where would some of the better winter access points be? Remember walleye fishing is not allowed on the Chippewa flowage through the ice. You may only fish for panfish and northern pike. Allowing Ice fishing only started in 2010, 2011. This year is also the 1st year in many years that they are drawing it down 8 ft from normal pool. Large area's of the flowage will be high and dry and current areas will be increased. This lake has 0 history of driving on it except for marked snowmobile trail. Last year a life long resort owner was lost going through the ice on a machine. I would highly suggest contacting bait shops and a guide. There are many access to the lake lots of them are in creek arms which equal current and with 8 ft draw down you may be going across bog which does not really freeze well. I do not know what you plan to fish for but you cannot fish for walleye. Once again nobody has ever ice fished or driven on this body of water at this drawdown level ever as Ice fishing has never been legal till the full 2011 season. Thanks for the helpful info, Mwal! I'm just looking to get out for a couple hours one evening with some buddies for walleye. Do you know of any lakes near Hayward that have permanent rentals you'd recommend looking into? I will call my buddy in Hayward if he knows of any and post tomorrow. Thanks for all the info. I never fish for marble carp anyway, so I'd be after crappies. Access would be on foot. 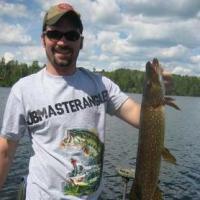 JbMaster Look for Ty Sennet web page he is putting crappie panfish reports for the flowage. Deerstalker my friend has not seen any permanent houses out yet. He said to call Hayward Bait and tackle and gave me these numbers 800-835-2803 715-634-2921 I have bought bait and tackle there and they seem to be straight shooters. They will know for sure. It was close to 30 below at the cabin so I am sure some of the slush is freezing.